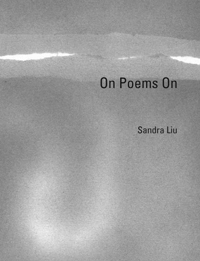 Even though there’s nothing particularly insular or fragmentary about Sandra Liu’s work, it’s still difficult to grasp exactly what’s going on in the book because of the restless nature of the poems’ wanderings through landscape, experience, character and image. Nominally this is free verse written in standard syntax, but individual lines or sentences in Liu’s poems aren’t trustworthy indicators of what might come next. This is always a good thing, because the unpredictability adds to the poems’ allure and as I read through the chapbook I found myself drawn closer and closer to whatever sharp turn the poem might next, unless there’s no sharp turn or the poem cuts off abruptly. The poems in On Poems On are a ceaseless lateral movement along or between landscapes either literal, linguistic, or informative that leave you with a sense of having visited a location or moment without being allowed to linger long enough for details of daily life to become mundane. My first reading of that produced an actual boy run over by an SUV during sectarian violence, but it’s maybe more plausible that the region Liu describes is itself a boy, restless and violent. In “Static” and in other poems Liu contrasts blunt fact with an ambiguity of that fact’s application, which turns what might otherwise be nature-heavy first-person reportage into a tenuous history-in-the-making. This is true elsewhere, and its matter of fact delivery makes it eerie as in “dither here”, in which a man casually mentions to the poem’s narrator their plumber was “shot in the head five times” as part of casual conversation. As much as Liu spends time offering a wealth of even detail, there’s a sense for the characters that populate the poems that what they witness or participate in isn’t to be taken for granted. What kind of bird is that. why she’s dressed this way. contrasts with the pale green velvet cushion. although navy is the actual color of the sky. Nicholas Grider is an artist and writer whose work has recently appeared in Conjunctions and Drunken Boat.